Many bees are oligolectic and collect pollen for their larvae only from one particular plant family or genus. Here, we identified flower scent compounds of two Salix species important for the attraction of the oligolectic bee Andrena vaga, which collects pollen only from Salix. Flower scent was collected by using dynamic-headspace methods from Salix caprea and S. atrocinerea, and the samples were subsequently analyzed by coupled gas chromatographic–electroantennographic detection (GC-EAD) to detect possible attractants of A. vaga. EAD active compounds were identified by gas chromatography coupled to mass spectrometry. Both Salix species had relatively similar scent profiles, and the antennae of male and female bees responded to at least 16 compounds, among them different benzenoids as well as oxygenated monoterpenoids and sesquiterpenoids. The strongest antennal responses were triggered by 1,4-dimethoxybenzene, and in field bioassays, this benzenoid attracted females of A. vaga at the beginning of its flight period, but not at the end. Parts of the study were supported by the German Research Foundation (Research Training Group 678). The GC for the electrophysiological study was provided by Konrad Dettner, and Andrea Beran provided advice on this system. Friderike Beyer and Irmgard Schäffler helped with biotests. Taina Witt and two anonymous referees gave valuable comments on the manuscript. Dötterl, S., Jürgens, A., Seifert, K., Laube, T., Weißbecker, B., and Schütz, S. 2005. Nursery pollination by a moth in Silene latifolia: The role of odours in eliciting antennal and behavioural responses. 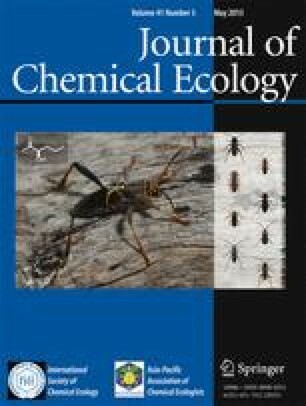 Manuscript accepted for publication in New Phytologist (in press); Available Online Early at: http://www.blackwell-synergy.com/doi/pdf/10.1111/j.1469-8137.2005.01509.x.